First! There was La Llorona (The story of a woman looking for her lost children.) Then! There was Chupa Cabras (The story of creature that was half-man & half goat who sucked people’s blood.) Now! The Legend Folklore Tale of the Mad Mexicans. The Mad Mexicans formed when, Rogelio “El Roy¨ Martinez (drums) and El Mero RockStar (bass), encountered each other in Dallas, TX at the Lew Sterrett Justice Center, LSU (Lew Sterrett University), as it is known to the people in el barrio. El Roy was paying a ticket for an expired license and El Mero was paying a ticket for no insurance. Both rockeros ended up becoming interested in forming a band (El Super Grupo Latino) and the search for more members continued. El Roy met Johnny “Geronimo” (guitarra) at Chito’s Custom Body Shop in the barrio (Oak Cliff). Johnny “Geronimo” was getting his G-ride all suave with a new custom paint job and adding 20 inch rims to go along with his 100 watt Sony stereo system. In short, another member was recruited. Next Geronimo met Robert Garza “El Sancho” (vocalista) at a Low Rider Show in Fair Park, where Geronimo was showcasing his pimp ride. Los Palominos y Los Tigres del Norte was the performing acts for the Low Rider Show. Robert was down with the cause and joined our familia. Then Robert met Rob “El Flaco” (percussionist) at the Underground Cockfights in Mexico. Robert lost his dinero to Rob, who shared his winnings with a nice chicken dinner & shots of Tequila Patron. Another memeber was found. El Mero met Rafa (vocalista) at the Dallas Tortilla & Tamale Factory. Rafa was buying a dozen-pack of tamales and El Mero was buying a jumbo size bowl of Menudo, the breakfast of champions. All six members were recruited. Now the Mad Mexicans are taking over and exposing the Mexican culture, barrio life & folklore to new crowds with outrageous stage performances, music y puro chingasos para todo el pinche mundo. The Revolution has begun. The Mad Mexicans are a Dallas based super Latino band comprised of styles such as hip-hop/rock/latin jazz mixed with the vocals in languages of English and Spanish. The Mad Mexicans are comprised of El Mero RockStar (Nelo Moa) on Bass, Robert Garza on vocals, Rafa Badillo on vocals, Geronimo (Johnny Lozano) on guitar and Rogelio Martinez (El Viejo) on Drums. The Mad Mexicans have been assembled from a various bands in the Dallas/Ft. Worth area such as PornLAB, Blitzt, MFI & Silver Pill. 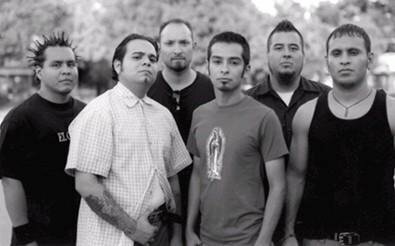 Mad Mexicans was formed in summer of 2002. Since then, the band has played with several national and local acts around the DFW Metroplex. Mad Mexicans released their E.P. titled Taking Texas Back on Taca Taca Records in October 2002. Their single, “Pinche Way” has been on rotation with radio station, 97.1 The Eagle, and has gotten great responses from the radio listens. Mad Mexicans was also nominated for “Best Rap Artist of Year” and “Best Rap Album of Year” in the The Eagle 97.1 (KEGL) Local Show Awards 2002. Mad Mexicans will embark on a South Regional tour in the near future. Mad Mexicans is an event waiting for you to experience…COME GET MEXICANIZED!